Richmond, Virginia may not be thought of for having a fascinating and interesting history with railroads (although trains have been serving the city since the industry's earliest days) but it offers the only place in the country where three different lines pass over one another known as the Triple Crossing. This magnificent feature first went into service at the turn of the 20th century when the Chesapeake & Ohio completed the third overpass at the location and since then it has been in continuous operation, which today is operated by Class I systems Norfolk Southern and CSX Transportation. Interestingly, there has never been a spontaneous three-way meet at the crossing (at least which has been captured on camera) but several photo ops have been performed over the years. 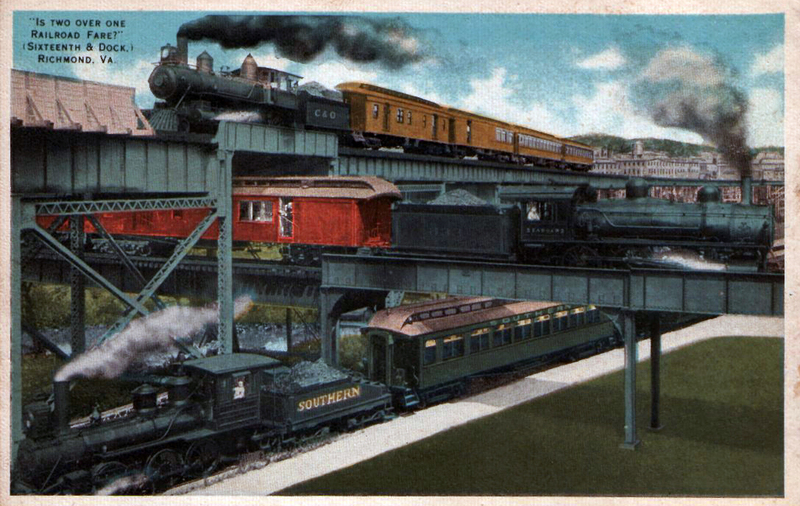 The history of the Triple Crossing begins with the Richmond & York River Railroad, whose line constitutes the bottom or first part of the crossing. The company was chartered in 1853 to connect the city with steamboats operating on the York River at a location known as West Point. 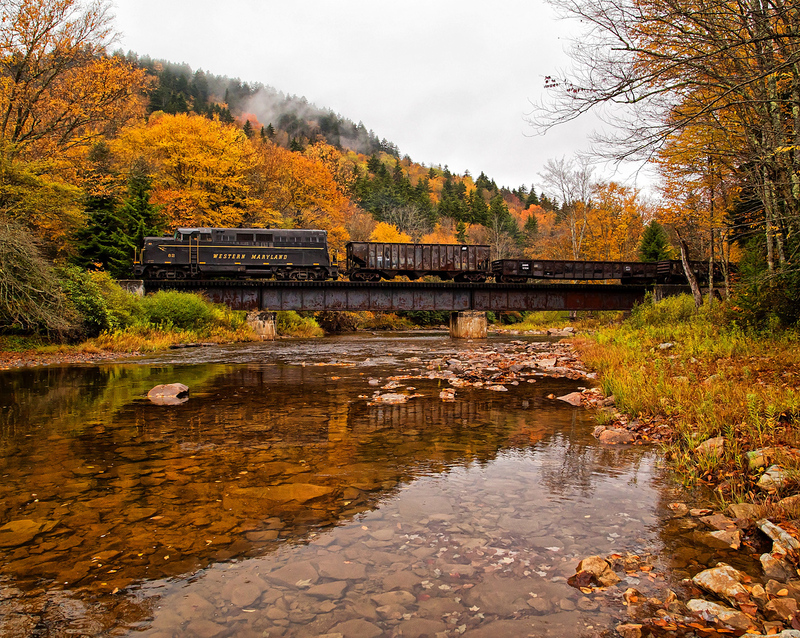 It took six years to complete the railroad, which opened its 38 mile system in 1859. The R&YR was an important asset for the South during the Civil War since it directly served Richmond and the important shipping channel to the east. After the war the railroad was acquired by the massive Richmond & Danville, which even during the latter 19th century stretched thousands of miles throughout the South. 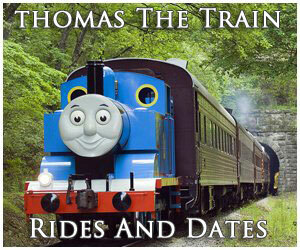 The road fell into bankruptcy during 1892 and emerged in 1894 as the now-classic Southern Railway system. Eventually, the line to West Point became part of the Southern's Richmond Division. 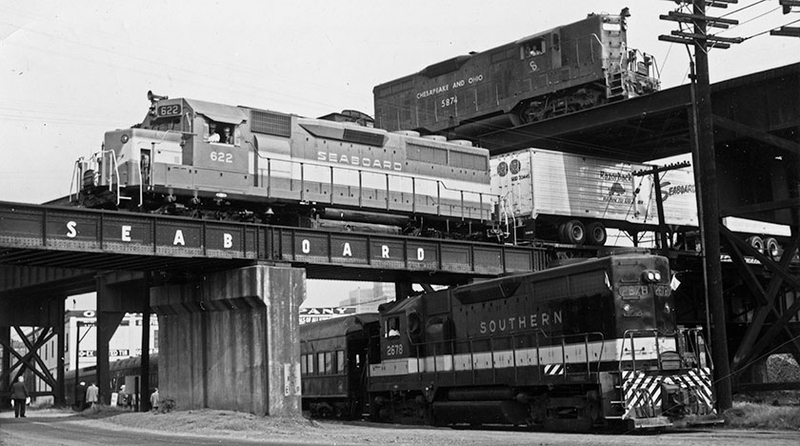 The second line of the Triple Crossing was originally built by the Richmond, Petersburg & Carolina Railroad, a company first chartered in 1882 to connect Richmond and Petersburg with the Raleigh & Gaston Railroad at Ridgeway Junction, North Carolina (present-day Norlina). Years of delays resulted in construction not commencing until 1897, which was finally completed three years later during May of 1900. The RP&C would soon become part of the much larger Seaboard Air Line system, that stretched throughout the south from Virginia to Florida by the 1920s. The route to Richmond became known as the SAL's S Line, which was part of its Virginia Division (the city constituted its furthest northern reach). The last component of the crossing, which sat at the top, was constructed by the Chesapeake & Ohio Railway in 1901 just after the RP&C completed its route. The C&O opened a three-mile viaduct that roughly followed the James River and linked its former Richmond & Allegheny route with its Peninsula Subdivision running to Newport News where its coaling piers were located. 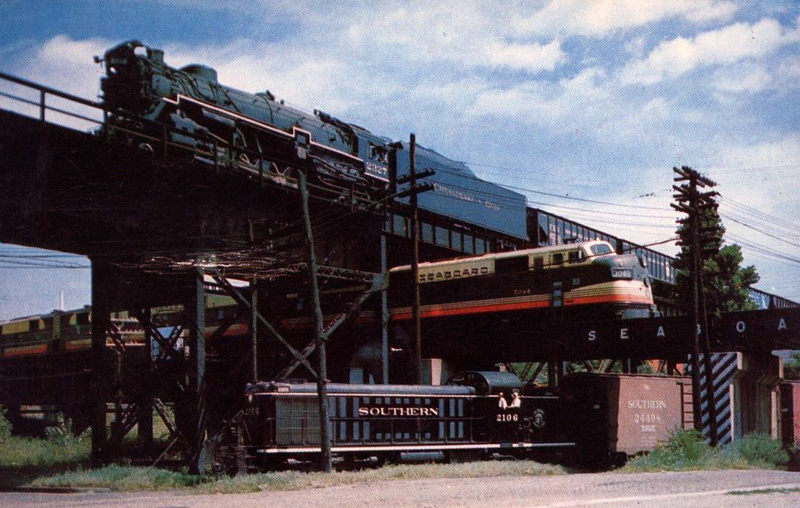 After the Triple Crossing opened following the completion of the C&O line it immediately became a fascination to the public thanks to its unique and rare status. 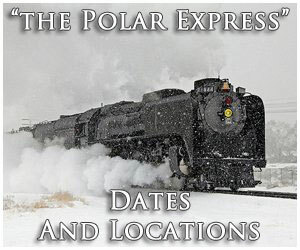 The first staged meeting at the location occurred in 1911 featuring three passenger trains. Due to the operational complexity of creating photo ops the railroads held them very rarely although a second such event occurred in 1926. Seaboard's assistant supervisor of its Virginia Division at the time perhaps put it best, "You try to get three railroads to do anything together and you'll have a devil of a time, but when you fool with something like this where three sets of intricate schedules are involved, you really have a problem." The first diesel era scene at the crossing took place in 1949, which was also shot in color. 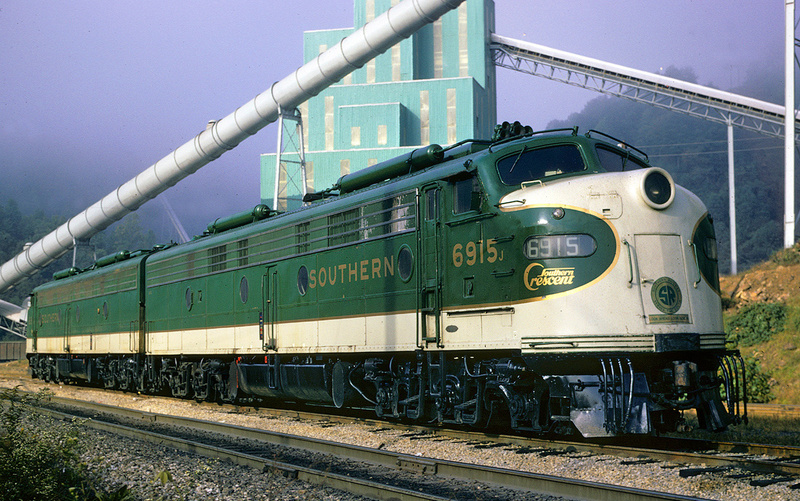 During this event the Southern used Alco RS3 #2106 and the C&O featured Class K-3a 2-8-2 #2327. The Seaboard, however, chose to be a bit more colorful using E7A #3048 adorned in its handsome chocolate, yellow, and orange passenger livery found on streamliners like the Silver Meteor and Orange Blossom Special. Despite the issues in attempting to create these three-way meets since 1949 there have been several more carried out. 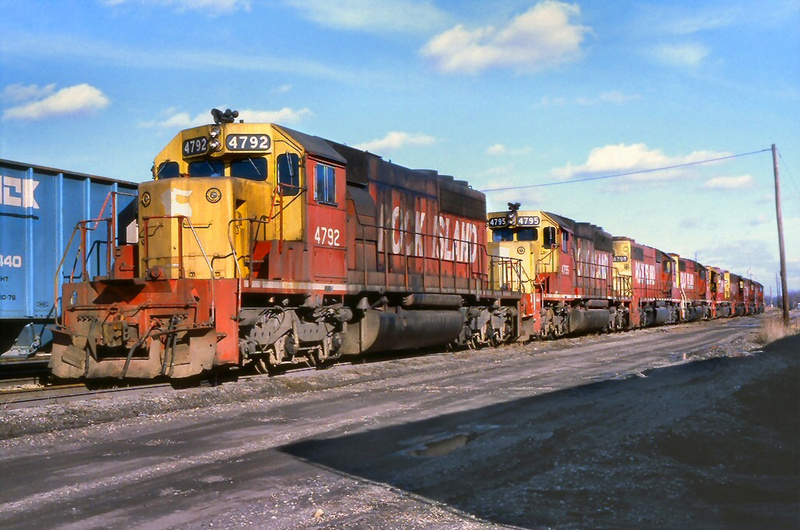 During the 1960s the companies again held a shoot posing Southern GP35 #2678, Seaboard GP40 #622, and C&O GP7 #5874. 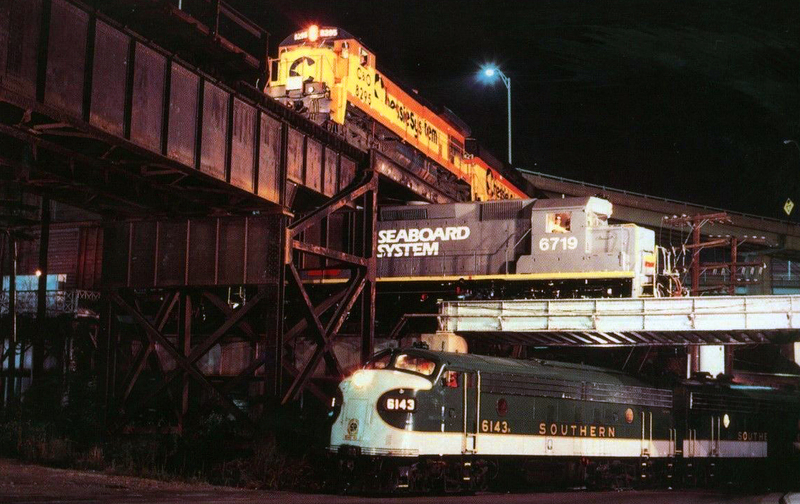 Perhaps the most famous meeting in recent times occurred on July 19, 1983 just before the classic paint schemes of all three disappeared into today's railroads CSX Transportation and Norfolk Southern (the Southern, of course, was technically already merged into NS by then and the SAL had been gone since the late 1960s); this was a night photo op and depicted Southern FP7s #6143 and #6141, Seaboard System GP40 #6719, and Chessie System/C&O B30-7 #8295. For a bit more reading about the crossing please click here. 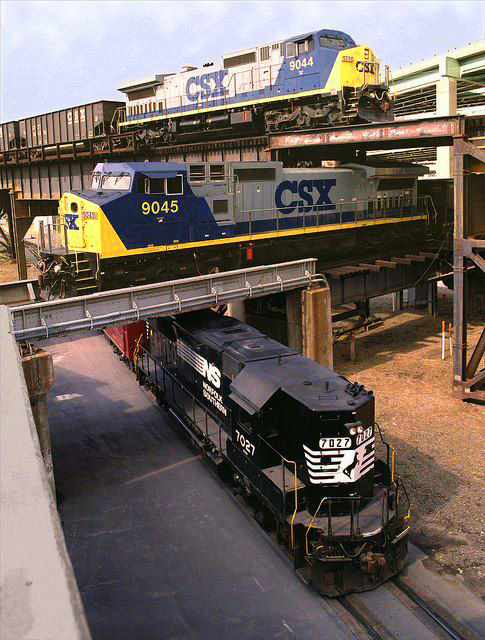 Since that 1983 meeting there has been one other special photo secession to occur at the Triple Crossing, which took place during the1990s. By then, of course, the two upper lines were owned by just one railroad, CSX, and Norfolk Southern controlled the ground-level route. During this shoot NS used GP50 #7027 and CSX featured C40-9W #9045 on the old SAL line and C40-9W #9044 on the former C&O route. Today, photographing any train at the crossing can be a somewhat frustrating and difficult affair since a new flood wall was constructed during the 1990s, limiting the number of angles from which to capture the scene (the latest meet was actually photographed from atop the wall, with special permission for the event).